“I wasn’t a finalist, that was disappointing, but I skipped one week of school for National YoungArts Week anyway,” he said, laughing. Academy Award-winning playwright Tarell McCraney sat on an elevated platform before an auditorium of high school students. He faced Joan Morgan, an American author and prominent journalist, who chuckled in response. This was no ordinary group of students. These were artists, from everywhere in the country, who had assembled together to learn, connect and collaborate with luminaries across all artistic disciplines. McCraney looked out at the unclear faces in the dimmed space. “That was alright. [For me] it has always been about pouring all of myself into what I do — not the accolades,” he said. For the last 36 years, the YoungArts Foundation has been supporting generations of emerging artists with a similar mantra. Through a blind adjudication process every year, the foundation identifies students ages 15-18 with genuine passion and great potential for various forms of art. These students receive valuable support through professional development, educational experiences and exhibition opportunities to become the best artists they can be. This was a group that had gathered in Los Angeles for an intensive week of interdisciplinary workshops and “master classes” with accomplished teachers. McCraney was very familiar with the program — in 1999, he took part in one in Miami. YoungArts’ network is far and wide, with many alumni making waves in visual, literary, performing and design arts. Some of them are actresses Viola Davis and Kerry Washington, Academy Award-winning filmmaker Doug Blush, Broadway stars Billy Porter and Tony Yazbeck, as well as recording artists Judith Hill and Chris Young. Most of them have come back to speak with and mentor teens that they once had been. Clara Schoenbeck is a YoungArts winner in photography, and a face in the audience. She is a junior from Pius XI High School in Milwaukee, Wis., who traveled across the country with anxiety and excitement. “I didn’t know how to act,” she said. “I was nervous to be going to master classes with professionals. [However,] they turned out to be fantastic, and they shared their artistic processes and inspirations with us, [which] has definitely helped me improve my eye with art and build my artistic mindset. Master class teachers present for YoungArts LA included producer Joan Scheckel, choreographer John Heginbotham, composer and violinist Daniel Bernard Roumain, violinist Vijay Gupta, visual artist Edward Arceneaux, director Lillian Barbeito, design duo the Haas Brothers, and the filmmaking duo Nancy Savoca and Rich Guay. These classes were personal, intimate conversations that aimed to engage and inspire students in a comfortable setting with professionals in their discipline. Some however, took especially interesting approaches. “We had this one master class [in which] we just went into the auditorium where we performed, and for the whole time, just screamed,” Arjang Mahdavi said. Mahdavi is a senior from Los Angeles County High School of the Arts who took part in the theater discipline of the program. Visual artists, designers and photographers in YoungArts LA, also had a chance to showcase their work on a project in an art gallery on the last day. Other young artists in the program found their niche in unconventional artistic disciplines. Xavier Carr, a senior at Crossroads High School, is a YoungArts winner who specialized in entertainment design, a career field he never considered until recently. Throughout the week, students in the Design Arts discipline received many professional development and educational experiences, including gallery visits, collaborative projects and lessons about life skills. “We’ve learned so much about what it takes to become an artist, to survive financially as an artist, to show your best work and to network with other artists,” Carr said. Across many other disciplines, students coordinated various performances and exhibitions to produce art together. “The jazz department held a phenomenal joint concert with the writers,” Jazz artist Austin Zhang said. Zhang is a six-year saxophone player from Plano West Senior High School in Texas. He traveled from Dallas for the week-long YoungArts LA. “[The writers] did spoken word poetry, and [the jazz players] improvised and created these beautiful musical textures under their words. It was such a novel experience. Where else could you do that?” he said. Similarly, artists in the dance, voice and theater disciplines came together in a collaborative performance. Mahdavi felt his outlook change as a result of the experience. The particularly unique aspect of YoungArts is how it unites artists from various — and some vastly different — disciplines together. For students, the experience can be both surprising and enriching. 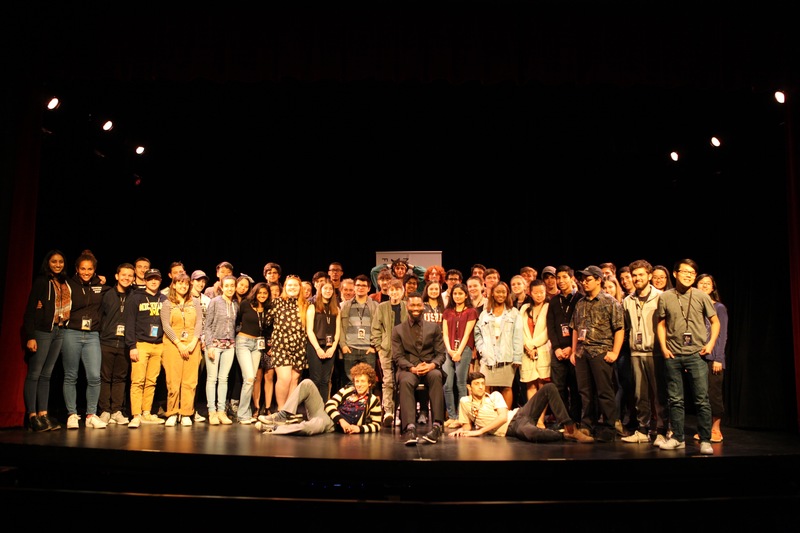 YoungArts reaches students largely by connecting to high schools across the country and visiting classrooms. However, many students — especially those in traditionally academic public schools — do not have access to information about opportunities. Leone has been with YoungArts as Vice President of Artistic Program for the last five years, and one of her primary responsibilities has been to oversee all regional programs such as YoungArts Los Angeles, as well as core and campus programs in Miami. Prior to that, she was involved in finding teachers for master classes. The alumni from YoungArts also play a significant part in running programs. Many have returned after their experience to continue their work with the organization in different capacities. Isabela Dos Santos was a 2011 YoungArts winner in cinematic arts who now works full-time as the YoungArts social media and video manager. “My life is just pre-YoungArts and post YoungArts,” Dos Santos said. “I’m a completely different person in all the best ways. When I went to public high school, a career in the arts was just what I knew off of a greeting blog post about my favorite artists or musicians. It felt accessible, but not part of my world, though I had instincts inside of me. The moment I got into YoungArts, everything became real. Her sense of belonging in the community led her to return to the organization in an administrative capacity and as a teaching assistant. “It’s become a part of my lifestyle,” she said. “Whether it’s working with choreographers, musicians, or animators for music videos outside of my job, or even doing my own short films, I’m always connected to YoungArts. I’m perpetually learning and getting the YoungArts experience. Dos Santos was also a U.S. Presidential Scholar in the Arts, a national honor that YoungArts winners are eligible for. Presidential Scholars receive a medal at the White House and have the opportunity to perform or exhibit at the Kennedy Center and the Smithsonian. On the final day of YoungArts Los Angeles, students sat in rapt attention as Tarell McCraney spoke of his experiences as an artist. It was early in the morning, but everyone was wide awake. “Mr. McCraney, have you ever been bothered by critiques and other people disparaging your work?” One student asked loudly, at the edge of his seat. McCraney paused slightly before answering. “It’s less about other people, and more about whether or not I can sleep at night,” he said. “Did I put out in the world anything that could do harm? Anything counter to what I value? That’s what matters to me.